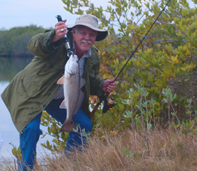 The Indian River Lagoon is rapidly gaining worldwide recognition as a fishing destination for redfish. 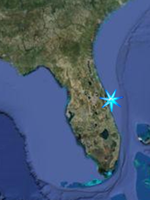 In fact, the redfish of the northern Indian River Lagoon and the Mosquito Lagoon have been featured in countless regional and national magazines, T.V. shows, and newspapers. The reds here commonly reach 30-35 lbs. Years ago, scientists discoverd that unlike other redfish populations around Florida and the Gulf Coast States, the redfish here do not migrate to the ocean to breed due to the lack of an inlet in the area. They live their entire lives in the lagoon, which is why it is not uncommon to see redfish 40-50 inches long cruising our grassflats in water just barely deep enough for them to swim. Seatrout are another common catch along the Space Coast, waiting along the grassflats to ambush any baitfish or shrimp that happens to get within their range. Snook and Tarpon are also commonly caught in the Indian River Lagoon and can be found in canals, along mangrove shorelines and out on the open flats. The area around Sebastian Inlet is especially good for these, in fact, Sebastian Inlet is one of the top snook fisheries in the state. Each year when the glass minnows, finger mullet asnd other bait species are cruising the lagoon they will be followed by ladyfish, jacks, schoolie trout, and many other species while mangrove snapper, sheepshead, black drum, flounder, whiting, pompano, round out the fishing opportunities along our Space Coast.